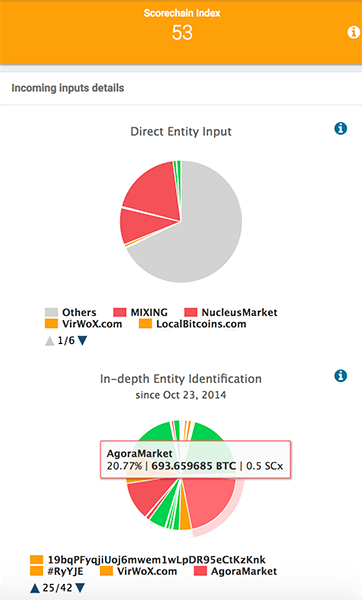 Want to assess how Scorechain Bitcoin Analytics could be helpful to your business? We would be very happy to schedule a live demo with you. Please fill out the form below so we could get back to you quickly! 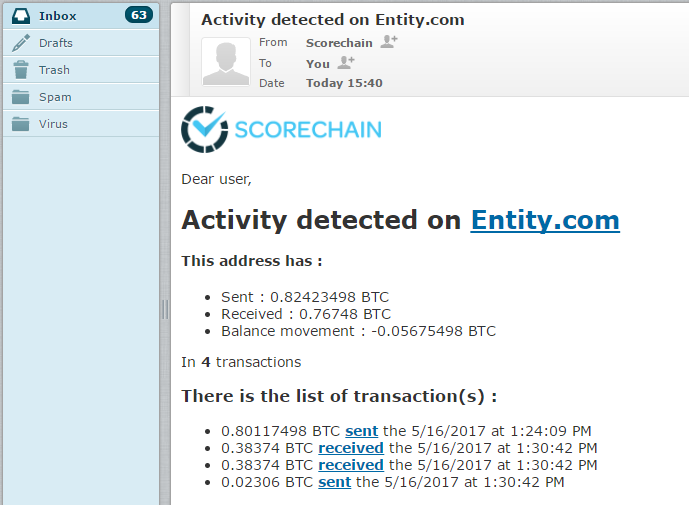 By checking this box, you consent to Scorechain collection of your first name, last name, email address and company. Our interactive activity chart allows you to analyse the activity of a Bitcoin address or entity (group of addresses) over its entire lifetime. 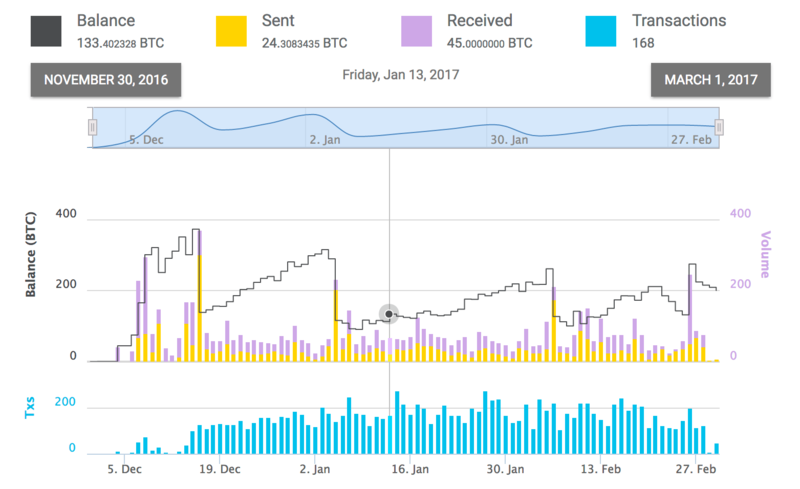 You can see transaction count, sent/received volume and balance shift on your desired period. You can zoom in and out a specific date, with a precision up to 10 minutes. With Blockchain data intelligence, we are able to detect addresses that belong to the same wallet or service. It allows a seamless monitoring with data consolidation. We are able to provide insights into bitcoins provenance and to show links with known entities (including Darkweb marketplace, mixing services etc.). First pie chart identifies direct input. The second chart is based on multi-level analysis of previous incoming transactions. The Scorechain Index: Manage due diligence and risk procedures. 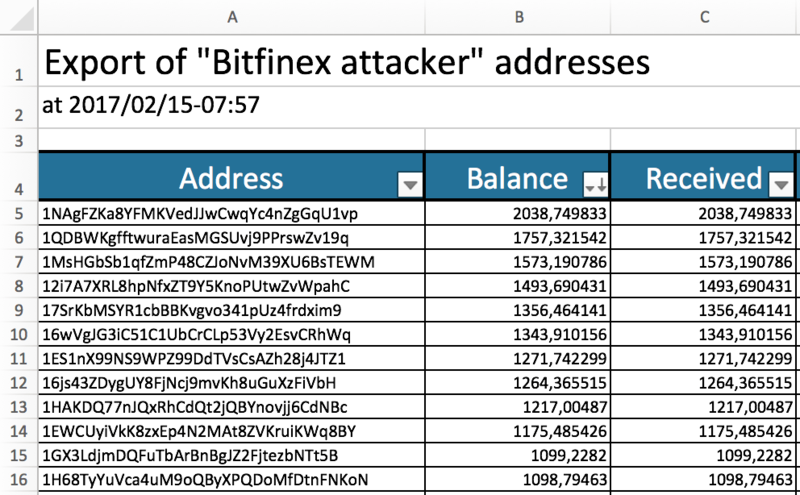 Based on all the information we collected on previous transactions, address activity, entity types (miners, mixing, payment platforms,etc. ), we compute a unique Index (SCx) to help you build a level of trust of Bitcoin portfolios. The Scorechain Index is an exclusive scoring that instantly highlights malignant behaviour of any Bitcoin portfolio. To let you set up your compliance procedures, you can define your own SCx, function of your market knowledge and experience. 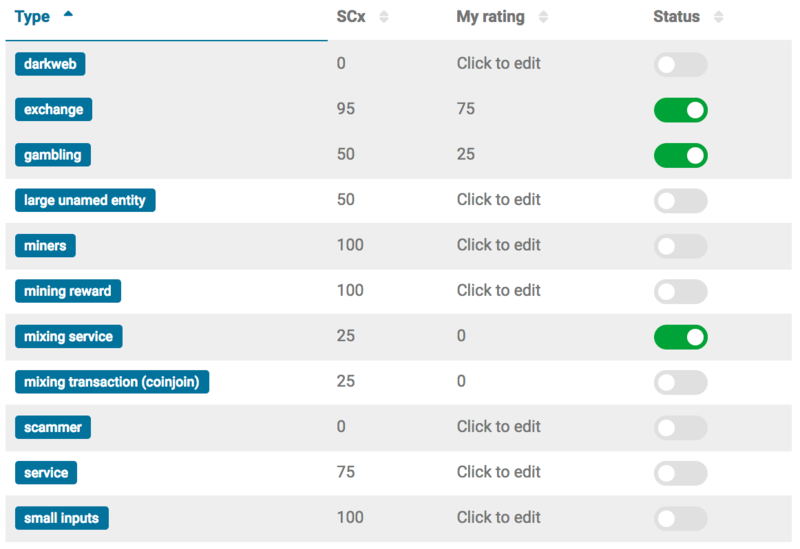 Customized SCx impacts all dashboard features and API. From any transaction, follow any inputs and outputs to retrieve identified entities in our interactive chart. Select simple or advanced mode to display the most valuable information you need on a transaction. Get all information you need in a single file. 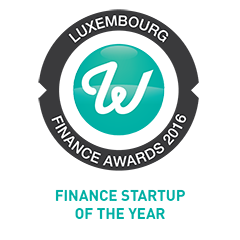 You can extract balances, transactions, origin/destination scoring for a selected period of time, in just a few clicks. With our alert notifications feature, you can be alerted by email for some particular movements. We let you define your alert conditions such as transaction amounts, thresholds and scoring impacts, as well as its frequency. Get any address, transaction, entity amounts in your preferred currency. This feature is available from the web dashboard, in the API results and also in the XLS and CSV exports. 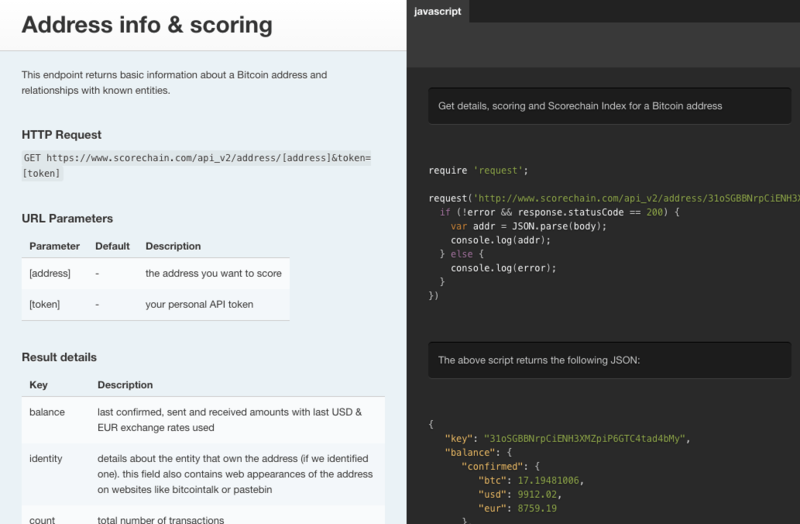 Scorechain API is the best way to enjoy all the power of our unique tool and algorithms. You will be able to get all the information that we compute, in real-time and JSON format. If you run a Bitcoin business/ATM, you will get extra-information on any transaction that is processed. Want to know more about Scorechain analytics? © 2017 Scorechain. All rights reserved.